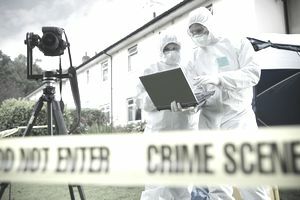 Crime scene investigators are specialized law enforcement personnel, who apply their forensic science knowledge to the documentation of a crime scene. They collect and analyze evidence such as tire tracks, footprints, blood splatters, and many other elements of a crime scene to piece together theories about what occurred, the sequence of events, and how long ago they transpired. Law enforcement agencies often lump together all sorts of personnel under the title of crime scene investigator, but for the purposes of this article, a crime scene investigator is a sworn peace officer with expertise in collecting and analyzing evidence gathered from crime scenes. An evidence technician is someone who gathers and processes crime scene evidence but is not necessarily a peace officer and is not involved in other aspects of investigating crimes. Forensic science dramas on television have increased the popularity of crime scene investigation as a career. Those shows may also have affected the public’s expectations of what crime scene investigators can bring to criminal prosecution. Many law enforcement personnel and prosecutors believe that such television programs have made jurors less likely to convict criminals when the prosecution does not present significant amounts of high-quality forensic evidence. Academic research has yet to prove the so-called CSI effect. Crime scene investigators assist with collecting evidence and providing expert analysis of that evidence. They are often called as witnesses in criminal cases to explain their theories about what happened at a crime scene. In a case, the crime scene investigator is called to the crime scene once law enforcement has already discovered or been called to the scene. The investigator assists in blocking off the scene from outside contamination, which could include helping uniformed officers set up barricades and caution tape and protecting evidence from damaging weather such as rain, sleet, hail, wind, sun, and snow. The crime scene investigator identifies, collects, and inventories evidence at the crime scene. They take photographs of the scene and of individual pieces of evidence, while also ensuring that the methods used to collect and process the evidence will stand up to scrutiny by defense attorneys. A judge can disallow improperly processed evidence. The investigator works with outside crime labs to analyze evidence that is beyond the department’s capability to analyze. For example, a large police department might send bullet fragments to a state ballistics lab if the department does not have a ballistics expert on staff. Academia: A bachelor's degree in forensic science is generally preferred. Coursework in law enforcement and forensic science can provide candidates an advantage over other applicants. In addition, crime scene investigators often have a background in criminal justice, biology, or chemistry. Experience: Law enforcement experience is required to become a crime scene investigator. Additionally, people wishing to become crime scene investigators should have training in the collection and processing of forensic evidence. Those already in crime scene investigator positions receive significant amounts of continuing education to keep up with advances in technology and professional practice. Certification: Certifications and licenses typically are not necessary for entry into this field. However, should you choose to become certified, the International Crime Scene Investigators Association (ICSIA) offers certifications to those who qualify. Applicants must be actively employed by law enforcement and must have at least two years experience in crime scene processing. Additional requirements for certification are listed on the site. To learn about the specific requirements for employment in your area, contact your local police department, the sheriff's department, and the state police to inquire about crime scene investigator qualifications at their facility. Intuition and judgment. This can only be gained through experience investigating crimes. Physical stamina. The work requires bending, stooping, reaching, lifting, and other physical activity that can be strenuous for some people. Those with physical disabilities may not be able to perform this work. The job also includes working in all types of weather. Strong stomach. The job is not for those with a weak stomach. Crime scene investigators are called out to the most gruesome events. Their tasks may include taking photos of murder victims, collecting samples of bodily fluids, and analyzing blood spatters walls. Critical and analytical thinking. The ability to evaluate evidence objectively and unemotionally is crucial, as oversights could be highly detrimental. According to the U.S. Bureau of Labor Statistics, 2017, the job outlook for crime scene investigators, included under the classification for forensic science technicians, is expected to grow 17% up to 2026. Jobs are found in large police departments and state police organizations. Smaller departments do not have the manpower to devote a position solely to crime scene investigation. This work requires traveling to areas that may be challenging to navigate due to difficult terrain, bad weather, or debris. In addition, crime scenes may be emotionally upsetting, gory, and difficult to view. Crime scene investigators may work staggered day, evening, or night shifts and may have to work overtime because they must always be available to collect or analyze evidence. Look at resources such as Indeed, iHireLawEnforcement, and SimplyHired for the latest job postings. These sites also provide tips on resume and cover letter writing, as well as preparing for and mastering an interview. Also, Crime Scene Investigator Network provides employment opportunities, as well as other resources. The International Crime Scene Investigators Association (ICSIA), the Association for Crime Scene Reconstruction (ACSR), and the American Academy of Forensic Sciences (AAFS) offer memberships that can lead to networking opportunities and possible employment. Some organizations include job postings. The Forensic Panel offers internships for those looking to gain experience in the field. Here, you will work alongside experts to see exactly how a crime scene investigator assists law enforcement in solving crimes. Also contact your local police station or other law enforcement facility to inquire about any volunteer opportunities that may be available.